They will have you over the moon. The moon is magic and mystery. Full, it triggers werewolves and mania (it must be a full moon), and the lunar connection has long been intertwined with women’s fertility. We represented the cosmic wonder in cakey cookie form, each phase outlined in chocolate. Our advice, eat according to the energy you want to create: new moon for new beginnings; waxing for creativity; full for abundance and sexuality; waning for release; and dark moon for peace. Cookies: Preheat oven to 350°F with racks in upper and lower third positions. Line two baking sheets with parchment paper. Whisk together flour, baking soda, and ¼ tsp salt and set aside. Beat butter with sugar with an electric mixer until pale and fluffy. Beat in eggs, one at a time, scraping sides of bowl once or twice and then beat in vanilla. With mixer on low speed, beat in flour and buttermilk in batches, beginning and ending with flour, until combined. Scoop rounded tablespoons of dough onto baking sheets about 1½ inches apart. Bake until cookie edges are just pale golden and springy to the touch, 11 to 14 minutes. Cool cookies completely on a rack. Icings: When cookies are cool, whisk together confectioners sugar, corn syrup, water, and mint extract in a small bowl. Divide out ⅓ cup into another bowl and stir cocoa in, adding a little additional water a teaspoon at a time until thinned to the same consistency as the white icing. Each should be spreadable but not too runny. Ice cookies following the moon phase chart on gatherjournal.com. 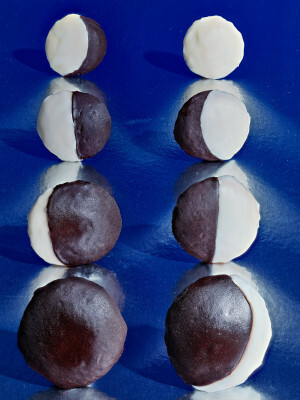 Spread icings onto cookies, allowing one color to dry slightly before icing with the other color. Flipping the crescents and halves top to bottom will give you waxing and waning moons. Let icings dry completely before serving.